Monday – Had a great workout with the hubby and did Insanity Max:30 Tabata Power. Tuesday – Ran 3 early miles. Wednesday – Ran 5 miles. Thursday – My 5 yr old wanted to go run so we ended up running a mile. 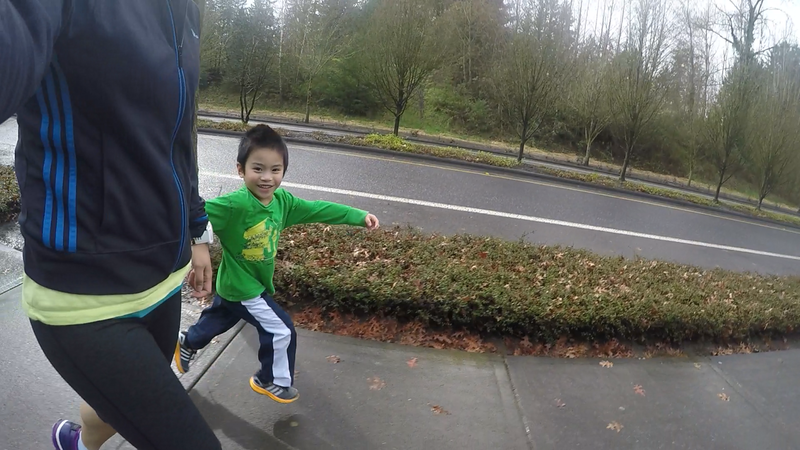 Friday – My 5 yr old wanted to run again so we ran a mile before preschool. After I dropped him off, I ran 3 more miles. Sunday was the big day, my first half marathon of the year. 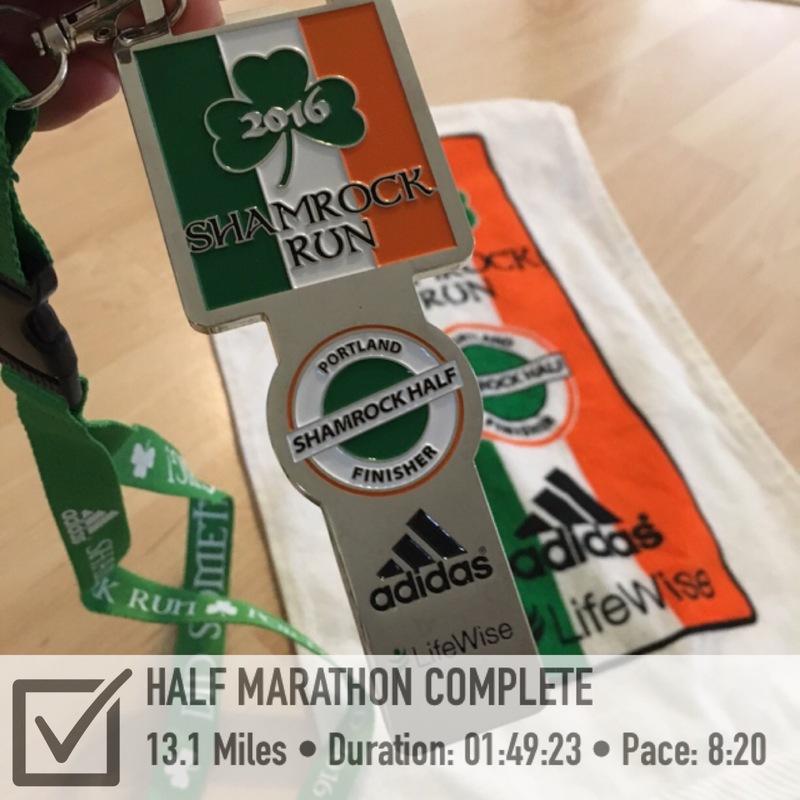 I ran the Shamrock Run Portland Half Marathon. Recap coming soon. The Corner Bakery Cafe just opened up near us and so we decided to give it a try for dinner. 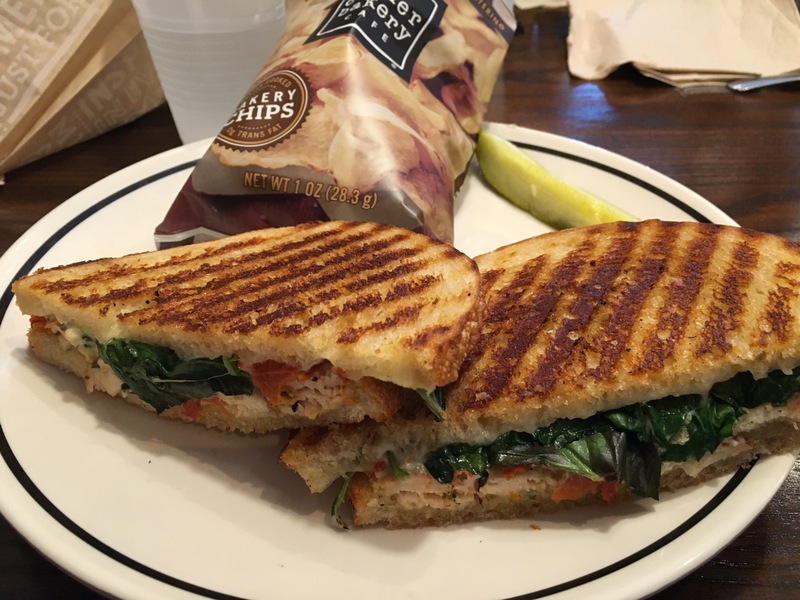 I liked the Chicken Pomodori panini sandwich. Nothing too exciting went on besides the race. But I’m so happy my 5 yr old has started running again. We had run before maybe twice last year and then stopped. But out of the blue he wanted to run. So I think it’s cool! Hope it lasts. My little guy jumping high. 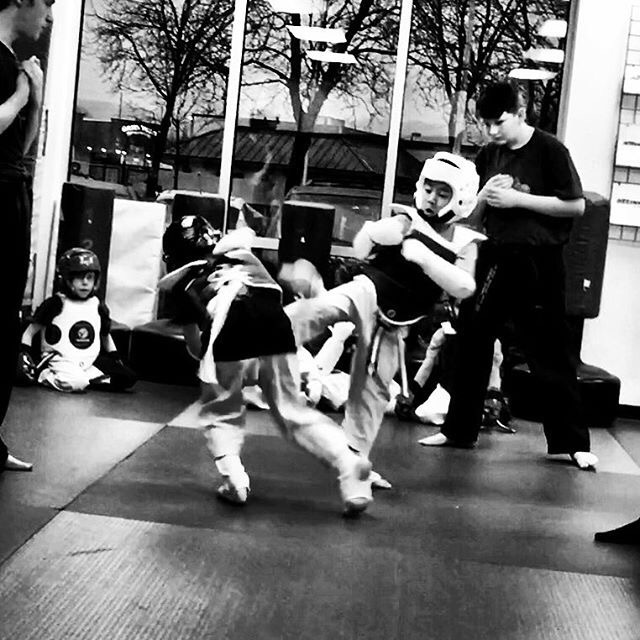 My 7 yr old sparring. They also had fun dancing this weekend. They asked me to video them lol. If you haven’t already, be sure to check out my giveaway on BeetBoost. That’s so cute and awesome that your five year old requests to go for a run with you! Even if he decides later on that running isn’t his thing and there are other activities he prefers, you’re instilling an active lifestyle in him early. All of that food looks delicious! I am about an hour and a half late for lunch, haha. Lol what a great video of the kids dancing! What camera did you use? It looks so crisp and clear! Awesome job on your half marathon too! You have improved so much! Thanks Sharon!! I just used my iphone to record the video. How great that your son asks to run! I hope my kiddos are like that one day! I have a 5K coming up on the 26th that I’m pretty excited about. I’m trying to PR & go sub25 which is a big goal of mine & I think I can do it. Thanks Jessie! Good luck on your 5k! You can get that sub25!! OMG!!! check out their moves!!!! Sign me up for dance lessons!! Great pictures. 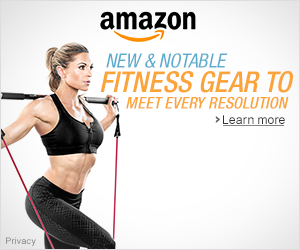 Is that an app that put the distance and pace on your pictures….that is cool. 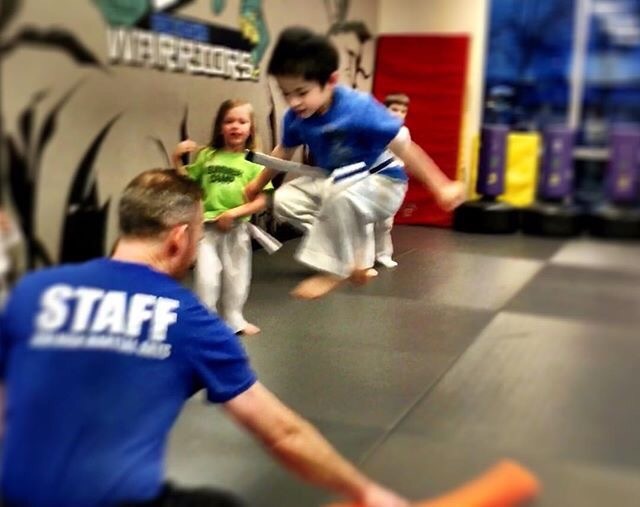 Look at your son jumping and kicking…how awesome! Way to go on your race!! They do have cool moves hehe. I’m not sure where some of them come from. 🙂 Oh, the app I used is called FitSnap on ios. Thanks!! Congrats on that awesome finish time for your race! Mine was much slower–that Florida heat and humidity did me in. Thanks Wendy! It would be so much tougher in that Florida heat and humidity. I love running with my kids. They usually join me in the summer, because during the school year I go running while they are all in school. I love the photo of you and you son running together. Love the day by day photo recap! What a great idea. And wow look at that half marathon time. Great job! Oh my goodness your boys have got mad moves!! I love it – great video! You had such a great race! What a great time. All you great workouts are certainly paying off. Great action shots of the boys doing their martial arts. Glad your little one is back to running again! Martial arts is definitely a workout for them, both mentally & physically! Thanks Judy! I’ll be having my race recap up soon. Your boys have skills! They are so cute in that video. It’s great the 5 year old wants to run again. He’s been watching his Mommy! 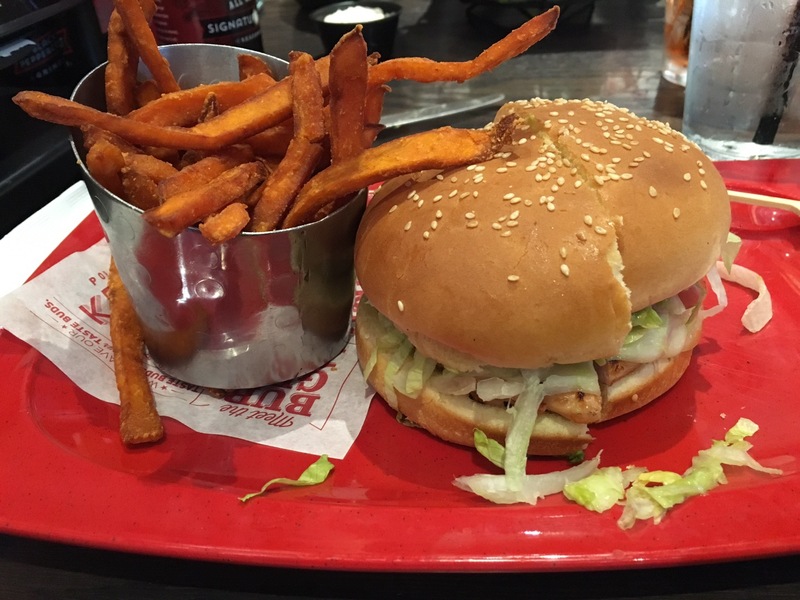 You had an incredible half marathon pace! Congratulations. I look forward to your recap. I like the medal. It looks huge. Thanks for linking with us Sherry. Thanks Holly! I love it when they dance. 🙂 It is a nice medal, which is also a bottle opener. Thanks for having the linkup! Wow I think the running bug has bit him! A mile before preschool is quite impressive too! Congratulation on your half! That is a great medal does it double as something else like bottle opener or something? It’s cool looking for sure! Look forward to the recap! Thank you for linking! Thanks Tricia! Hope his running bug lasts lol. Love running with him! The medal is a bottle opener too. Thanks again for having the link up!